905ArtTalk: We know what she paints but, what does she think about the suburbs? We know what she paints but, what does she think about the suburbs? Interview with Martha Eleen conducted via email by Su-Ying Lee, Curatorial/Administrative Assistant, Art Gallery of Mississauga. Su-Ying Lee: The title of your exhibition at the Art Gallery of Mississauga was Into the 905: The View from the Car. Was this title meant to imply anything about the character of the 905 communities? Martha Eleen: My experience of the suburbs has been about passing through on my way between my cabin near Port Hope and my home in Toronto. The suburban landscape is so familiar that for many years I hardly noticed it, and then as a result of my observational painting practice, certain things began to catch my interest. It occured to me that since the car is the connector between the domestic, commercial and industrial spaces, and a lot of people commute along this route, the view from the car is probably the way a lot of people experience this landscape. SL: The title was taken in a strictly literal way by some viewers who believed exhibiting the work here meant it was a portrait of Mississauga. Please clarify weather there is truth in that assumption. ME: I had not been to Mississauga before the show and I was amazed when I saw it! Everything is bigger and vaster and more modern there. I want to paint it next. 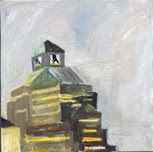 Mississauga makes the suburbs of my paintings look old-fashioned and scruffy in comparison. SL:What drew you to paint the images in the series? The paintings in the exhibition, while they held evidence of human life (buildings, towers etc. ), were void of the actual people who live in the 905. SL:The way in which you treat the sky, although on small panels, gives the feeling of expanse which lent a sense of isolation. What was this compositional choice dictated by? ME:The sky is huge in the suburbs and Southern Ontario has a very particular light, it can be a kind of light grey glare. The season between winter and spring has a lot of colour in the sky and I love to paint in this season as the sky is dramatic and changing early in the afternoon. SL:Some of the comments about the exhibition called for more colour! I think those who craved colour felt that the series would have been more successful if a different pallet was chosen. I think the pallet you used was successful because it elicited such strong reactions. Why the steely blues and neutrals? ME:I try to mix the exact local colour. To my eye, these paintings represent the colours that are there. Many of my paintings show the light changing as well as the changing point of view. As a painter, subtle nuances of colour fascinate me i.e. light cement against grey sky, close in value, but affecting each other. 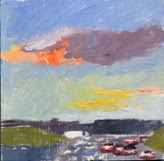 When I painted in Newfoundland the palette was completely different. I'm on my way to paint in the Yukon. I'm expecting the light and colour to be interesting there. SL:Do you believe there is a correct or incorrect way to read a painting? ME:Painting is a visual language, not to be confused with household decor. Painting can be a very visceral form: it can engage all the senses...sound, temperature, emotion for example. Like music, painting can be read on many levels, from a catchy tune with mass appeal to a jazz arrangement, the nuances perhaps appreciated more by other musicians. I think most artists feel successful when their language can be interpreted by anyone, when they cross these boundaries, and when they can show people new ways of seeing and change the way they look at the world around. I have been influenced by Morandi who painted bottles for his whole career with an ever-increasing devotion to the nuances of colour, composition, space and light concerns. Some people think these paintings are dull and not entertaining. I have been moved to tears by the tenderness of emotion and the ability of the artist to be present to his subject matter......and it's just bottles! I think the more painting that people see and take the time to understand, the more ability they will have to interpret and appreciate the visual language. I think of painting as a tool for looking. SL:Your work was created on the periphery of the communities you painted. 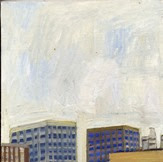 Over the course of the exhibition you made several trips into Mississauga's downtown core where the Gallery is situated. What are your thoughts on that landscape? ME:I want to paint it. I'm fascinated by the monolithic aesthetic, the brightness and reflections on the glass, the fact that you must drive between buildings even downtown, the huge spaces. The scale of everything is so big. I think I would paint really big. Also at the cafeteria of the Civic Centre I had my first view of the suburbs from above! Quite different from looking up at small buildings over the highway barricades. SL:You painted on the side of the 400 highways with a custom easel attached to your steering wheel. From what I've read, this view engaged you while you were driving to more pastoral locations for landscape painting. Does The View from the Car have a place in the genre of landscape? ME:I think I have added the idea of time and motion to a genre that is often static. Adding a conceptual element to traditional plein-air oil painting bridges the 2 disparate art forms that are at odds with each other in today's art world. As well landscape is often romanticized in observational painting i.e. pastoral locations and old buildings which refer more to art history than our daily world. I'm interested in being present to what's around me in my daily life as well as the conceptual and new media modern art. SL:Some viewers recognized the view as part of their weekly commute, others commented that you revealed something new, poetic even, still others were offended by the way in which they believed you were depicting the 905. Recently I have been approached by reporters wishing to discuss the suburbs as the new frontier for artists moving away from an urban core. Is the relevance of the suburbs to be simply defined by it's contrast to urban centres? ME: I don't see it as a contrast so much as a growing context for daily life. There's a lot of people living in the suburbs now and its also very multi-cultural. I think the inner city has been exploited as much as possible as a subject of art and there are fewer surprises there. The suburbs is a new phenomenon and free to be discovered. My intention is not as an authority on the suburbs, but rather to turn my artist eye toward the landscape as a passer-by and perhaps this a fresh viewpoint that I would not have if I was continually surrounded by this environment. A tourist always sees more excitement in the things that are too ordinary to notice by the inhabitants. The point you raise of the work being created on the periphery of a larger community, or of any chosen community is an interesting one. It's something that makes me think back to one of the previous articles about the BIAF and other independent cultural activities in the GTA.